In an earlier post on Loan against Property, we had discussed the product in detail. In this post, we look at Loan against property product from State Bank of India. As I understand, you will NOT get this loan for a plot or for an under-construction property. There is some conflicting information posted on SBI website about usage of funds. We know that Loans against Property can’t be used for speculative purposes. However, at a few places on the SBI website, it is mentioned that the loans against property can’t be used for business purposes either. In addition, your monthly income will also determine your loan repayment ability. As mentioned above, the bank may also consider rental income from the property to arrive at your net monthly income. Maximum permissible EMI/NMI is as follows. To increase your loan eligibility, you can consider adding co-borrowers in the loan. Needless to say, only a co-borrower with a source of income will result in higher loan eligibility. There is an additional restriction. Loan under LAP must be liquidated before the eldest borrower attains the age of 70. The loan product permits loan even for the properties held in the name of spouse/kids/parents/siblings. Therefore, you can take out a loan on the property that is not in your name or where you are a joint holder. In such cases, all the owners of the property will have to sign up as co-borrowers. Therefore, if you have to take out a loan for a property that is held in the name of another family member (or jointly held with you), it will have to be a joint loan. Now, for the property held in the name of an older member of the family (especially parents), this rule of maximum age of 70 may affect loan tenure, and effectively your EMI. What Is the Rate of Interest for SBI Loan against Property? 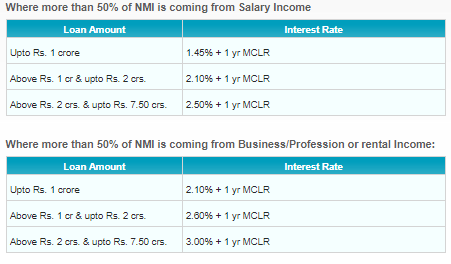 Even though the rate of interest keeps changing, I am reproducing the screenshot from SBI website. If the rental/professional/business income makes for more than 50% of your net monthly income, you will have to pay a higher rate of interest. In my opinion, this is justified too. Sources of income other than salary may not be as reliable. Moreover, the value of the asset may also be tied to the rental income it generates. From the bank’s perspective, this is a double problem. Not only is your rental income going down but the value of the property may also be going down at the same time. Even though the banks keep significant margin (through lower LTV), the interest cost should still reflect the inherent risks. Note that you do not get any tax benefit for repayment of loan against property. What Are the Other Charges? Processing fee is 1% of the loan amount subject to a maximum of Rs 50,000. In addition, there will be valuation charges, stamp duty for loan agreement and mortgage and property insurance premium. Please understand all the charges before signing up for the loan. GST shall be levied on all the charges. Do not take a loan unnecessarily. If you feel that the repayment of the loan is going to be a problem, consider selling the property than taking a loan against it. You will at the least save on the interest cost. Not an easy decision to make but it is always better to keep your emotions out. If you must take a loan against property, do consider the offers from other banks too.